From Princess Leia to Darth Vader, each of the characters in the Star Wars movies has a unique look. You don't need to buy an expensive costume to emulate your favorite characters. If you're feeling creative, you can make your own outfit to wear to your next fan event, costume party, or Halloween get-together. 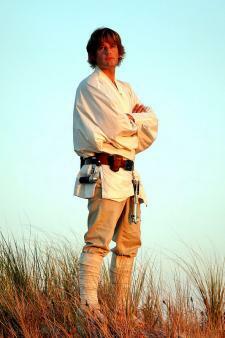 As the main character in the original Star Wars movies, Luke Skywalker is an important part of the story and an essential character at any fan event. Fortunately, his costume is easy to make using thrift store clothing and a few craft supplies. Start by cutting the collar off the white shirt. Cut the neckline into a V-shape, and remove all the buttons. 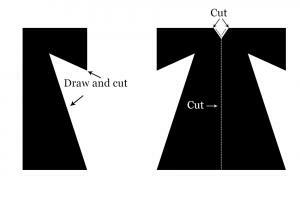 Turn over the raw edge of the shirt neckline and hem it to give it a finished look. Place the boots on a work surface. Starting at the toe of each boot, layer masking tape to create the off-white appearance of Luke's footwear. When you reach the ankle, simply wrap the tape around and around until you get to the top. Very lightly brush the pants, shirt, and boots with the brown ink pad to give them a dirty look. Pay special attention to seams, the knees of the pants, and the elbows of the tunic. Put on the pants and boots. Put on the tunic, overlapping it in the front. Use the brown leather belt to hold the tunic in place. Wrap the buckle of the belt in aluminum foil to create a rectangular shape. Carry the light saber to complete your outfit. 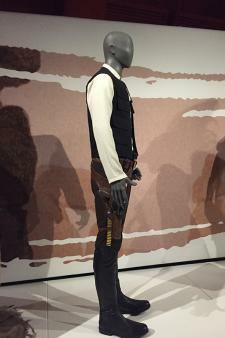 Another main character, Han Solo makes a great choice for any Star Wars event. You can easily make his costume from old clothes and fabric scraps. Place the black vest on your work surface. Cut four three-inch by five-inch rectangles. Apply a piece of adhesive tape to one long side of each rectangle. Then use your iron to attach the rectangles to the front of the vest as pocket flaps. You'll want to place two in the chest area and two below those. Sew a metal button on each flap. Cut a piece of red seam binding that's the same length as your jeans from the waist level to the ankle on the outside seam. Iron the seam binding to remove any creases. Apply the adhesive tape to the back side of the seam binding, and then iron it on to the outside seam of each jeans leg. Put on the jeans, Henley, and boots. Tuck the jeans into the boots and put on the belt. Layer the vest over the Henley. Pick up your toy blaster and have fun. 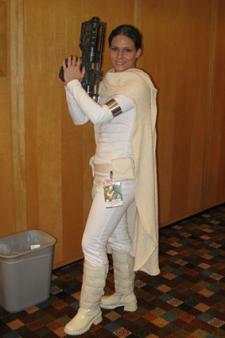 If you have a sewing machine you can make your own Jedi costume. This means you can dress as anyone from Anakin Skywalker to Darth Sideious. Depending on the character you are emulating, you can choose traditional dark brown or black fabric. Use a 60-inch-wide, medium-weight cotton material, since it's easy to work with and inexpensive. Fold the fabric in half so the short sides are together. Lay the fabric on the floor. Fold it again lengthwise, lining up the long edges. Measure yourself around the chest, just below the arms. Divide by four and add two inches. Write down this number, labeling it "chest." Measure your arm width by wrapping the measuring tape over your shoulder and under your arm. Divide that measurement by two and add three inches. Write this number down as well, labeling it "shoulder." Starting at the top, folded edge of the fabric, measure down the side folded edge until you reach the shoulder measurement. Make a mark with the dressmaker's pencil. From this mark, measure out from the fold until you reach the chest measurement. Make an obvious mark with the dressmaker's pencil. Angling your yardstick out from the obvious mark you made, draw a line toward the raw edge of the fabric. 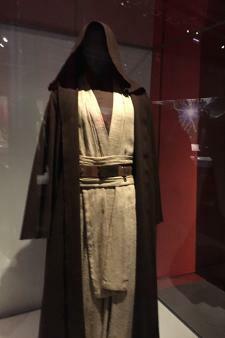 This will create the bell-shaped sleeve for your Jedi robe. Then angle the yardstick down from the mark and draw a line until you reach the bottom of the fabric. Cut on these lines. 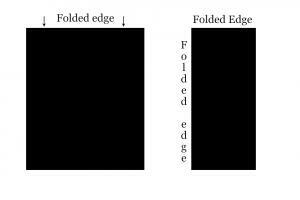 Unfold the fabric once, leaving it folded at the top. Pin the sides from the bottom of the robe, under the arm, to the end of the sleeve. Sew both sides. Place the robe on the floor again. Cut up the center through one layer of fabric until you reach the top. Then cut a three-inch notch on each side to open the neck. Try it on and trim the neckline to fit you. Hem the robe to hide all raw edges and adjust the sleeve and overall length to fit you. Put on the shirt, pants, and boots. Layer the robe on top. Princess Leia is a great character for girls and women, and she wears several different outfits in the films. You can make her gold bikini costume for a fun look. If you're looking for something a bit more modest, make the Jedi robe in white. Pair it with a white turtleneck, white pants, and white boots. Don't forget a toy blaster. 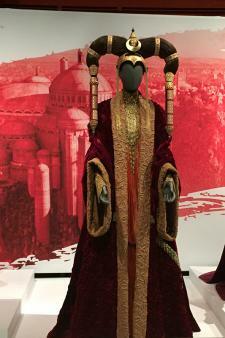 Padme Amidala is the heroine of three of the Star Wars movies, and her costumes are nothing short of amazing. Although crafting some of these looks yourself would be very difficult, you can easily make her white cropped fighting outfit. Cut off the right sleeve of the shirt. Cut off the shirt's hem until it's cropped to a level you feel comfortable wearing. Use the sewing machine to hem the raw edges. Measure your upper arm. Cut two strips of gray craft felt that are the length of your arm measurement and two inches wide. Apply duct tape to one side of each of these strips, smoothing over any rough edges. Put on the leggings, boots, and crop top. Wrap one duct tape arm band around your upper arm, and secure the band to itself with more duct tape. Repeat with the other band. Put on the blaster and holster. 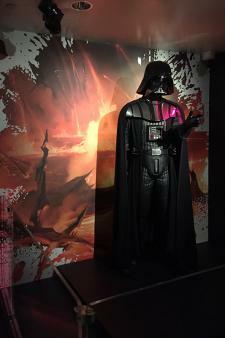 Darth Vader's costume is a bit more complicated than many of the others. For best results, it's a good idea to use a sewing pattern for a Darth Vader costume to create this iconic look. Another complicated costume due to the armor, dressing as a Stormtrooper will take more time and effort. You can create your own Stormtrooper outfit using a good set of instructions and the necessary supplies. No matter which Star Wars costume you choose, you'll have a great time dressing up as your favorite character. Making your own costume only adds to the creative fun.